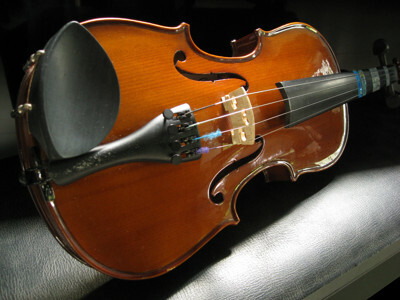 This is my little brother's violin. I put it on the piano seat, and the sun shine on it through the windows, but it looks like it's under a spotlight. Where we have come from has absolutely no bearing upon where we are capable of going. I guess your brother doesn't care for the colored violins, huh? LOL. Another nice picture. To me this is a superb post. I love the rich full tones you have captured on the violin. The lack of backround color and the composition take this from good to exceptional. I like this one better than your other violin picture. I love how the violins are shinny, you did a very nice job. Maybe next time get the table not to show. This is a beautiful picture, thank you for sharing it.